The Copernicus Sentinel-3 satellite takes us over eastern US. 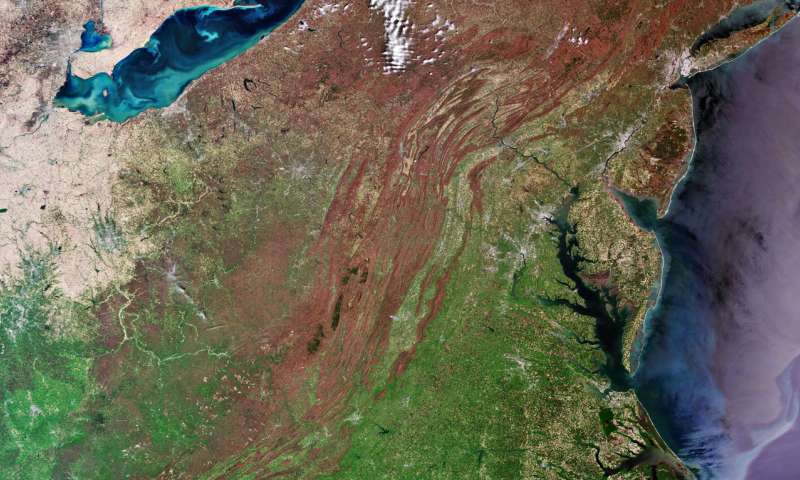 Spanning a huge area, including the states of Ohio, Maryland, West Virginia and Delaware, a number of major cities can be seen in this true-colour image. The megacity of New York is visible in the top right. A megacity is defined by the United Nations as a city with a population of over ten million. According to the latest estimates there will be 43 megacities across the globe by 2030. Further down the coast, the US capital of Washington, D.C. can be seen in the upper-central part of the image. Washington, D.C. is a territory, not a state. The first part of the capital's name is in honour of the first president of the US, George Washington, and D.C. stands for District of Columbia, derived from Christopher Columbus. This true-colour image from Sentinel-3's Ocean and Land Colour Instrument (OLCI) shows sediment being carried into the North Atlantic Ocean along the coast. Sediment and potentially algae can also be seen in Lake Erie in the top left. This lake is the fourth-largest of the five Great Lakes of North America. It has a surface area of over 25 000 sq km. Around five million tonnes of a type of rock salt called halite is mined from beneath the lake every year. The state of Ohio is also known for its fertile soil, coal, and natural gas reserves. The brown that dominates the central part of the image represents mountainous areas and forests, running through West Virginia and beyond. Known as the Mountain State, this is the only state completely within the Appalachian Mountain region. At around 460 m, its average elevation is higher than any other state east of the Mississippi River. To the north of West Virginia, Pennsylvania, which takes its name from a combination of Latin words, meaning 'Penn's woods', stretches up towards New York. Half of this state is covered by forests, including Allegheny National Forest, which can be seen in the top-centre of the image. Sentinel-3 is a two-satellite mission to supply the coverage and data delivery needed for Europe's Copernicus environmental monitoring programme. The mission gathers data on our oceans, land, and ice to monitor and understand large-scale global dynamics. It provides critical information for a range of applications from marine observation to large-scale vegetation monitoring.